Increase the log size for at least 1gb. Set retention method to "Overwrite events as needed". 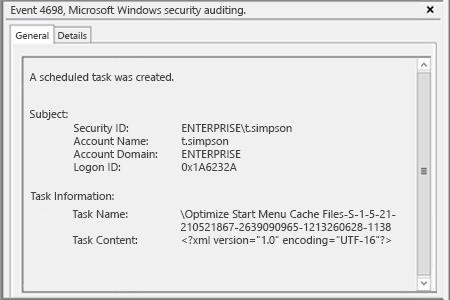 Open Event viewer and search the Security log for the 4698 event ID with to find latest created scheduled tasks. 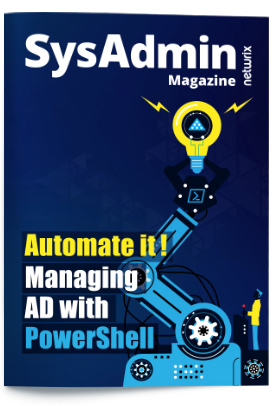 Add arguments (optional): -File "filepath to our script"
Now you will be notified about every scheduled task created on your windows server via e-mail that will contain scheduled task creation time, name, computer name on which this task was created and the name of the creator. 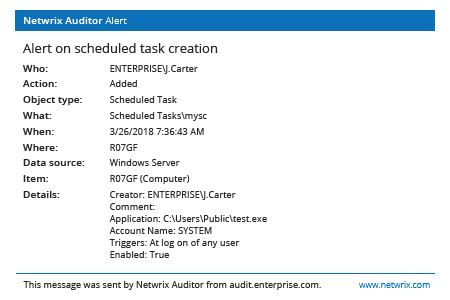 Run Netwrix Auditor → Navigate to “Reports” → “Windows Server” → “Windows Server Changes” → Select "Scheduled Task Changes" report → Click "View". From the Netwrix Auditor home page navigate to “Alerts” → Click “Add” → Specify alert’s name. Navigate to “Recipients” → Click “Add Recipient” → Specify an email address for the alert. 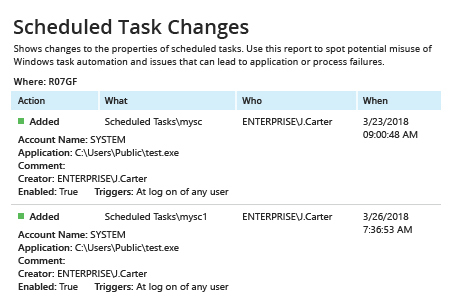 New scheduled tasks created on Windows Server by someone who doesn’t belong to your IT department might indicate a virus attack, which could result in a sensitive data leakage. In order to reduce this risk, it’s necessary to monitor creations of scheduled tasks in real time.